Happy almost weekend everyone! 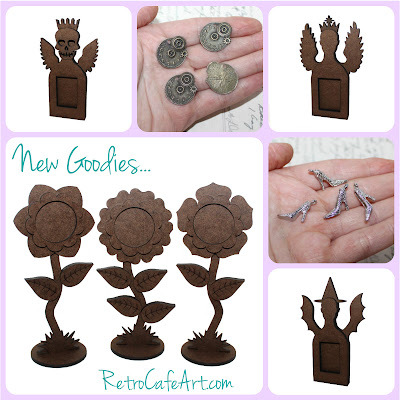 We have several new goodies in the shop! THREE MORE awesome Fairy Shrine Kits (not for the swap, but just for FUN), Articulated Doll Shrine Kits in two new smaller sizes, STUNNING Stand-Up Flowers (my favorite), and more! Hopefully some art samples will follow soon. I'm "dying" to try the Dia De Los Muertos Fairy! See it all HERE. Last week we announced our NEW Fairy Shrine Kit Art Swap! Come play and make some magic will us! Details are HERE. 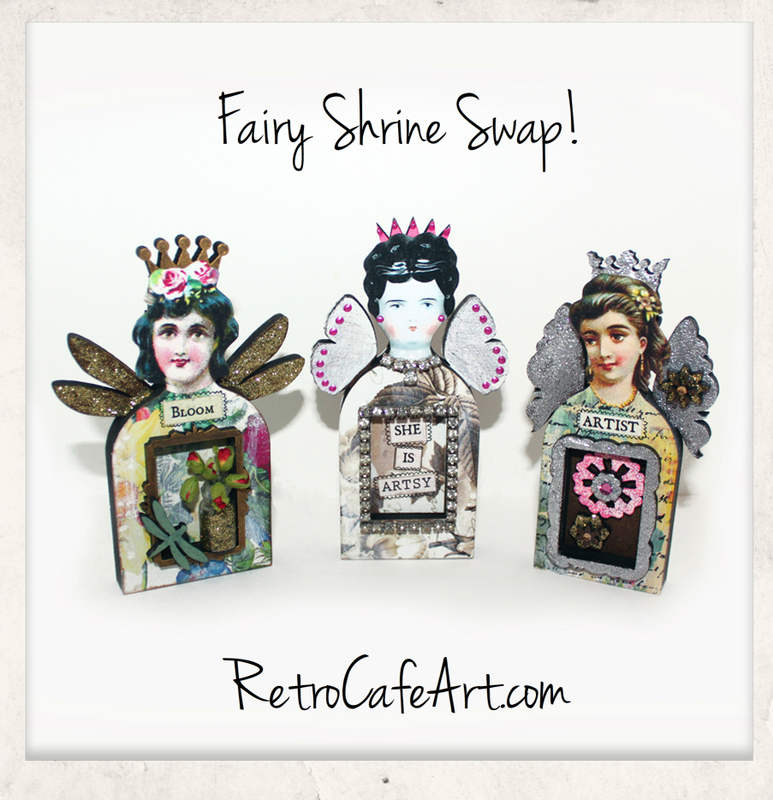 Inspiration Fairy Shrine ART SWAP! Guess what? 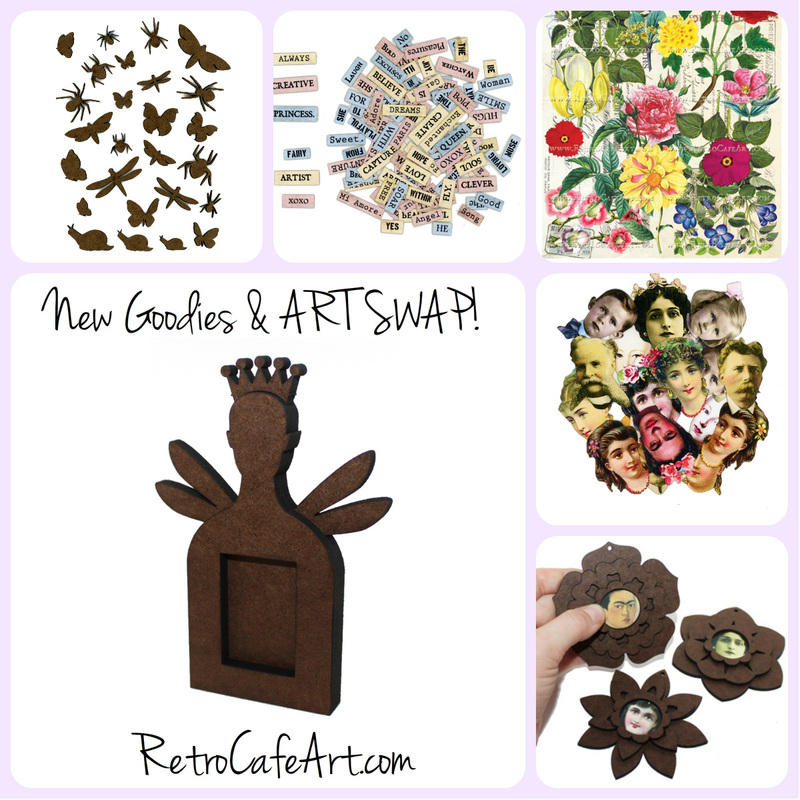 It's time for a new ART SWAP at Retro Café Art Gallery! 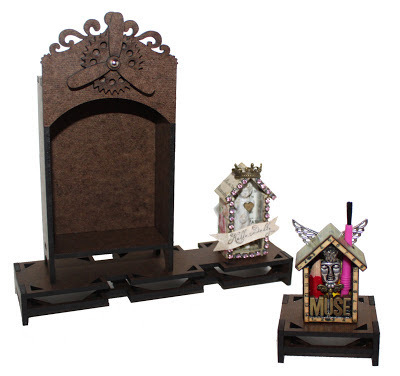 If you thought the Mini Houses were fun, just wait until you start playing with these Inspiration Fairy Shrine Kits! You can get the full details HERE. And of course there are several coordinating goodies, many of which are on SALE in honor of the SWAP! You can find them all HERE. What kind of Fairy will you make? Here are a few ideas: Explorer, Artist, Garden/Flower Fairy, Circus/Animals, Steampunk, Chef/Cook, Paris, Celestial, Halloween/Gothic, Frida/Day of the Dead, Beach/Summer, Marie Antoinette, Vintage/Junk Queen, Antique Doll, Collector, Dancer, and I'm sure you can come up with lots more! Happy Father's Day - a GIFT for YOU! 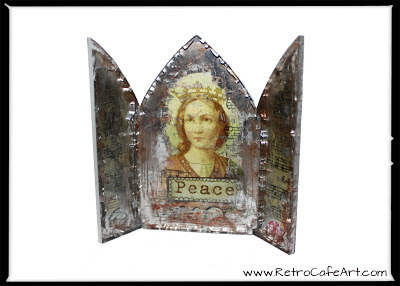 Happy Father's Day from Retro Café Art Gallery! 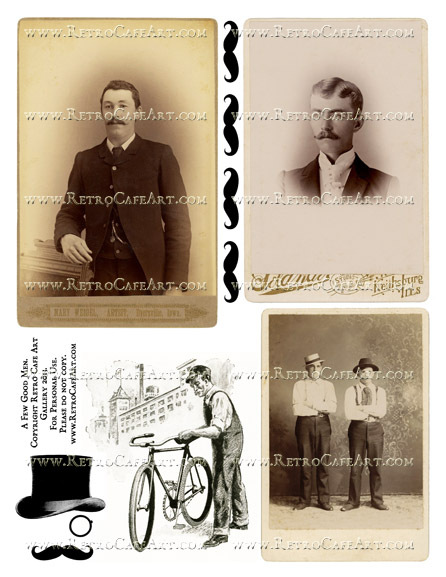 As a GIFT to YOU, our wonderful customers, please enjoy this Free Digital Collage Sheet containing "A Few Good Men" from our personal collection! Download it FREE on our site HERE. Come see the groovy new goods in the shop this week. Nine BRAND NEW Retro Collage Sheets, FUN Vintage Goodies, and the Prima Vintage Mechanicals Collection. You can find it all HERE. 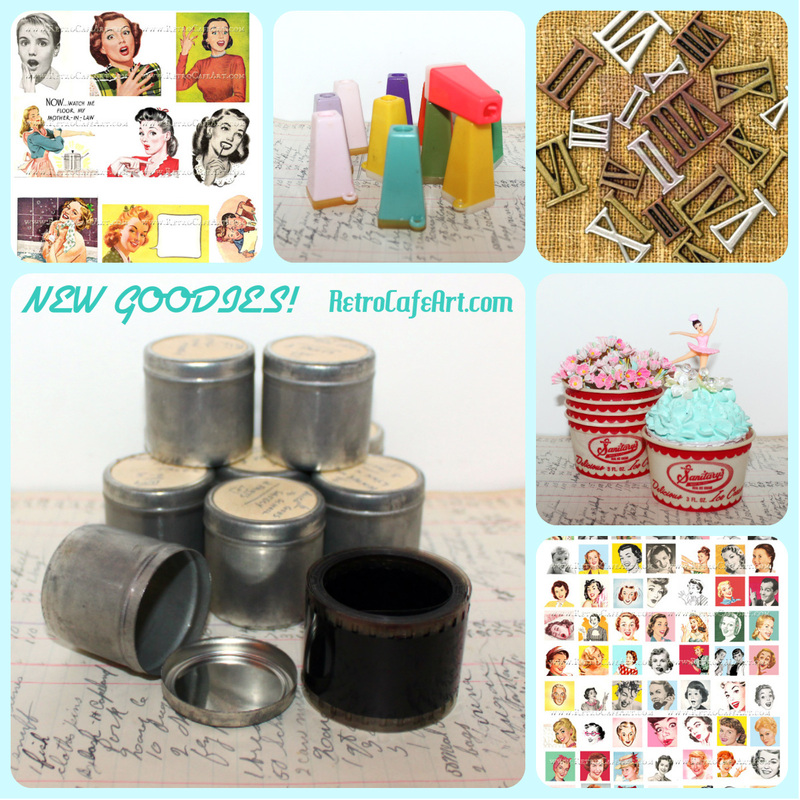 And hurry, several of the Vintage Goodies are in limited supply! And for even more nostalgia, check out Design Team Member Linda Cain's hand using the Hand Trinket Shrine Kit! 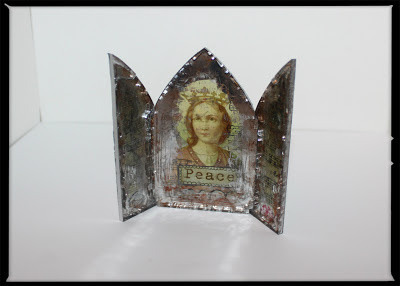 You can find more photos and instructions on Linda's Blog! Anyone else feel like putting on a Poodle Skirt? Happy Saturday everyone! Come see what's new in the shop! 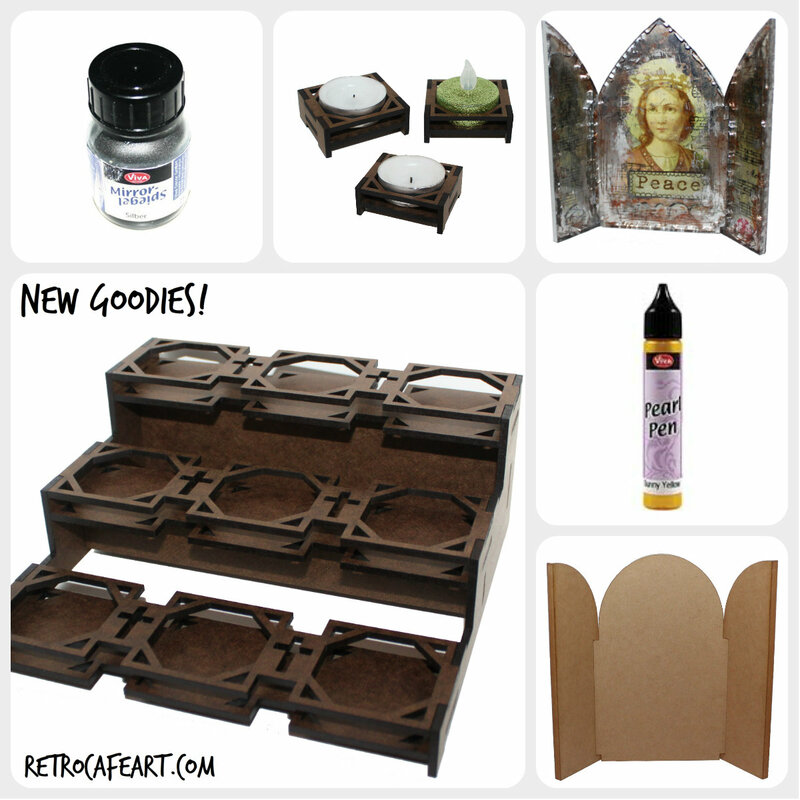 Three new Shrine Kits (including a house with a balcony - squeee! ), Glitz, and Bezels galore! I've always wanted to own a house with a balcony. Until then, this will have to do! You can catch it all HERE. Hi everyone! 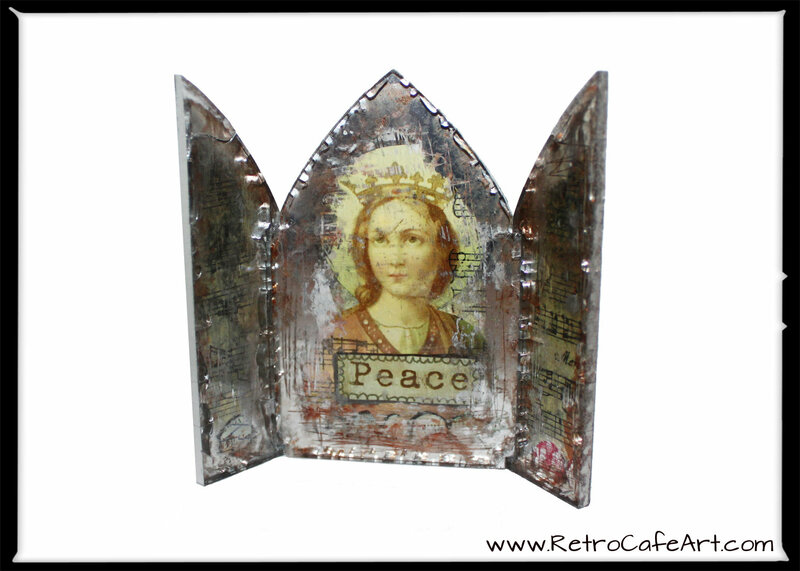 I'm going to walk you through how to make the gorgeous shrine above using our new Clear Acrylic Arch Shelf Shrine. 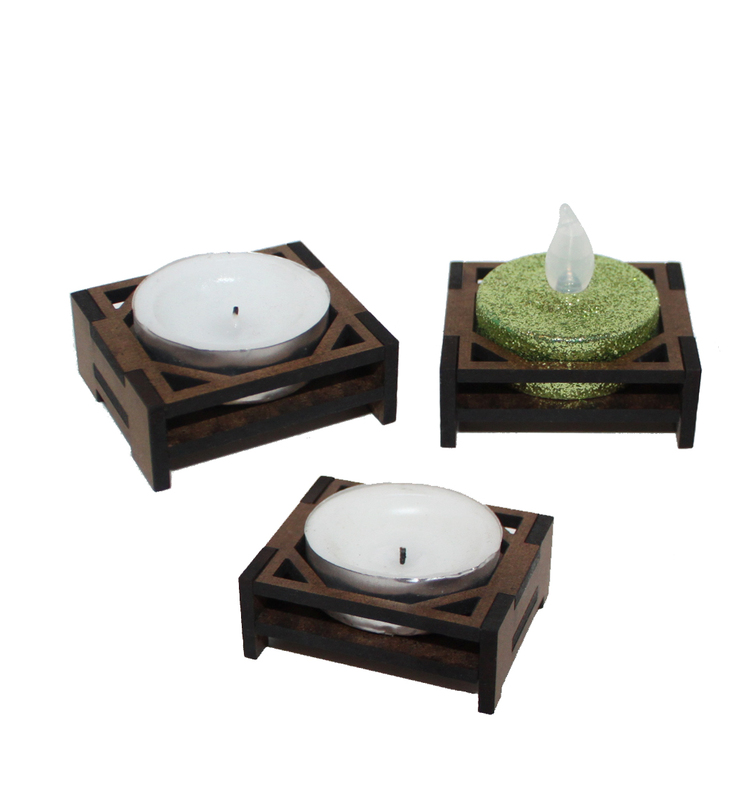 Of course you could also use the Pointed or Rounded Shrine. I'm calling this my Antique Mirror Relic Shrine because that's exactly what it ends up looking like! I started with a piece of scrapbooking paper for my background and gathered my Collage Sheets. I'm using Full of Grace, Collage Words, and Collage Borders. Of course you can use what you would like. And have your Acrylic Shrine ready. Roughly trace around the shrine. This will be the area you collage. 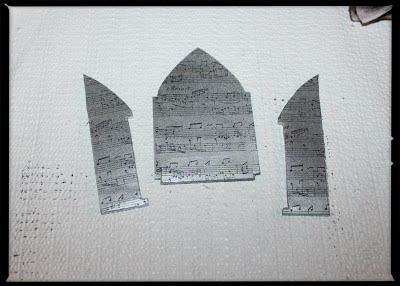 I found it easier to cut out my pieces after I finished the collage. This way I could be more messy! 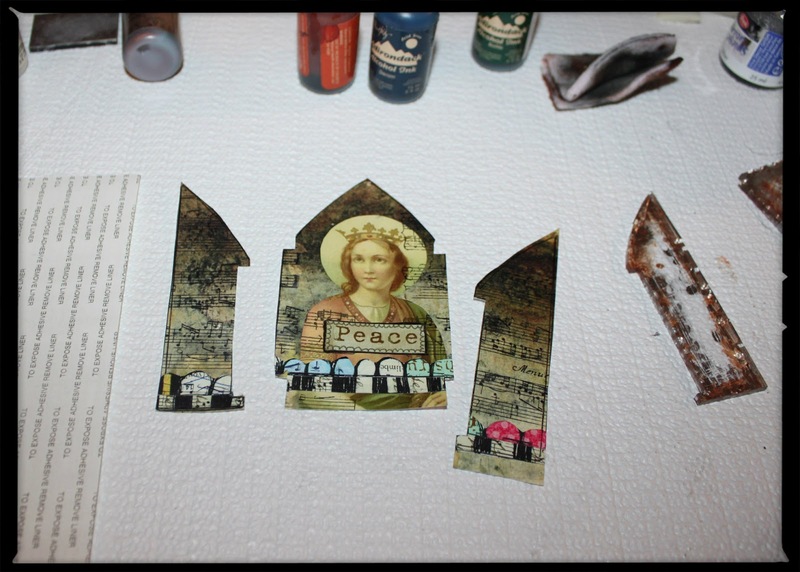 Using Mod Podge I attached images from all three collage sheets above. I added a bit of stamping and doodling. Of course you could stop here and simply cut out your pieces and attach them to your shrine. But I wanted a more aged, antique look. Remove the protective paper from both sides of your shrine pieces. Once you have a corner started, it easily peels right off and the pieces are ready to go. No prep needed. Next I added some of the new Viva Mirror Paint around the edges. At this point you will be working on the back of the pieces so everything shows through the front. I added the paint using a sponge. What happened next was very unexpected, but I loved the result. Because I got some paint on the edges, some cracks started to form. This really gave the pieces an authentic cracked mirror look! Using my fingernail, I also scraped off some of the paint to further the aged look. Don't use anything too sharp or rough as it might scratch the acrylic. Unless you want that look! A finger nail was perfect. The mirror paint really does reflect and looks like real mirror, though it's difficult to photograph. The "red" areas in this photo show the light reflecting off the "mirrored" areas. 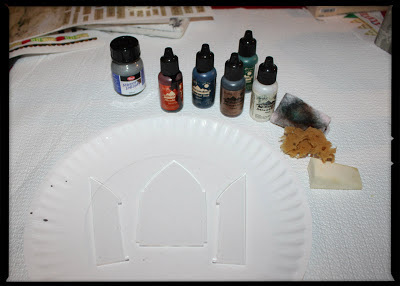 Working from the back again, I also added some alcohol inks to the pieces. You can use any colors you choose. 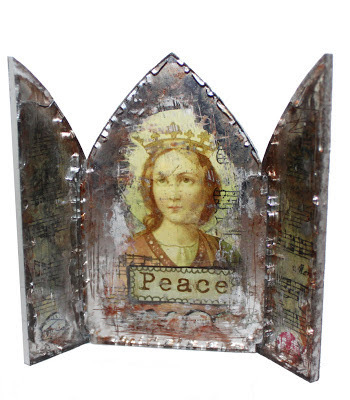 I wanted to mimic a rusty look, so I used Terra Cotta mixed with some Copper and Pearl Mixative. Using your shrine pieces again as a template, cut out your collage. First trace the entire thing like you did earlier and cut it out in one piece. 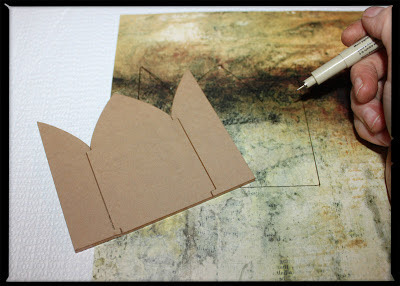 Then use each side piece as a template to cut out the sides. 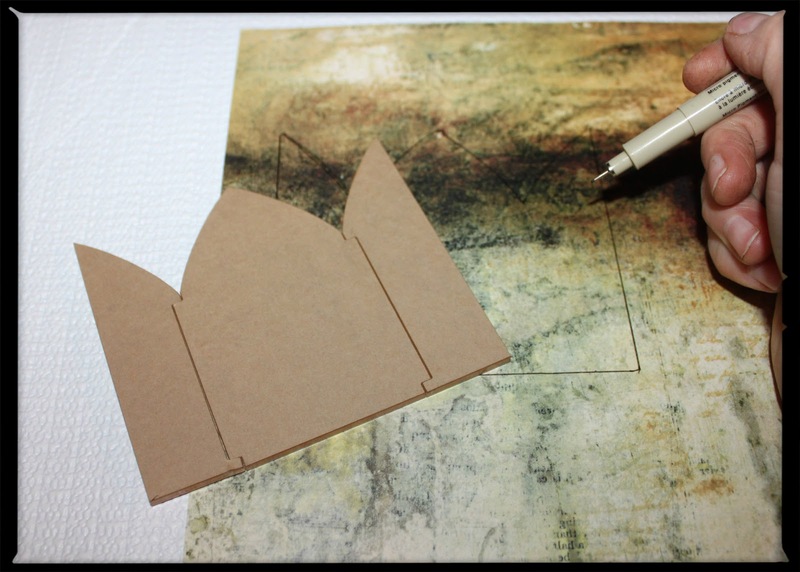 Trace first, then cut. 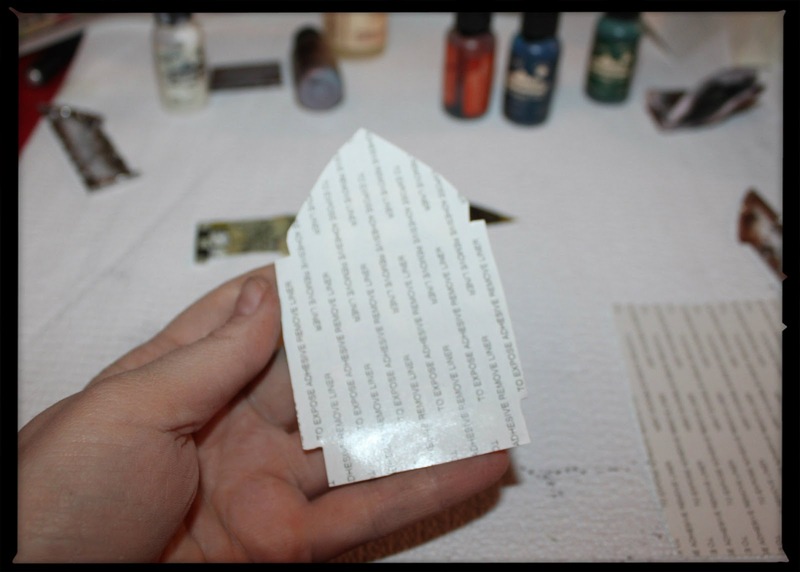 Cut out a piece of Incredi-sheet that is larger than the collage piece. 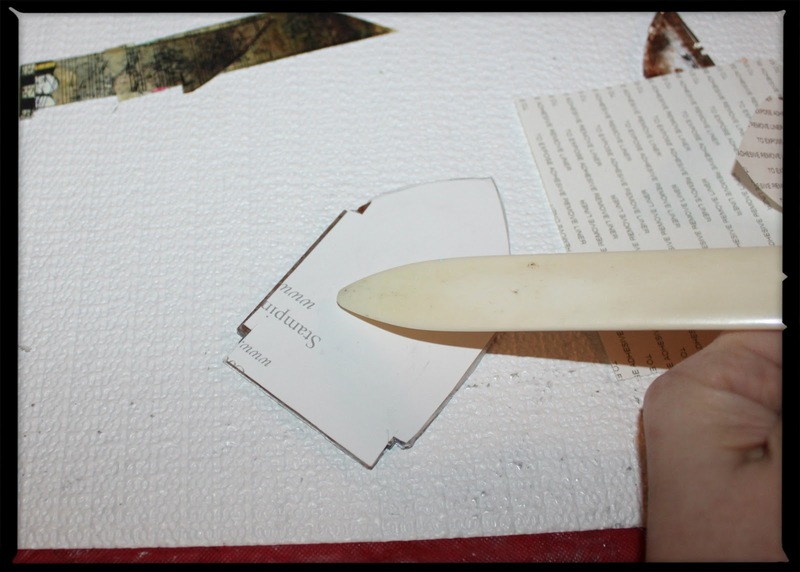 Peel off the adhesive backing from one side of the Incredi-sheet and then lay your collage piece on top (face down) pressing firmly. Cut off the excess Incredi-sheet. You basically now have a sticker. 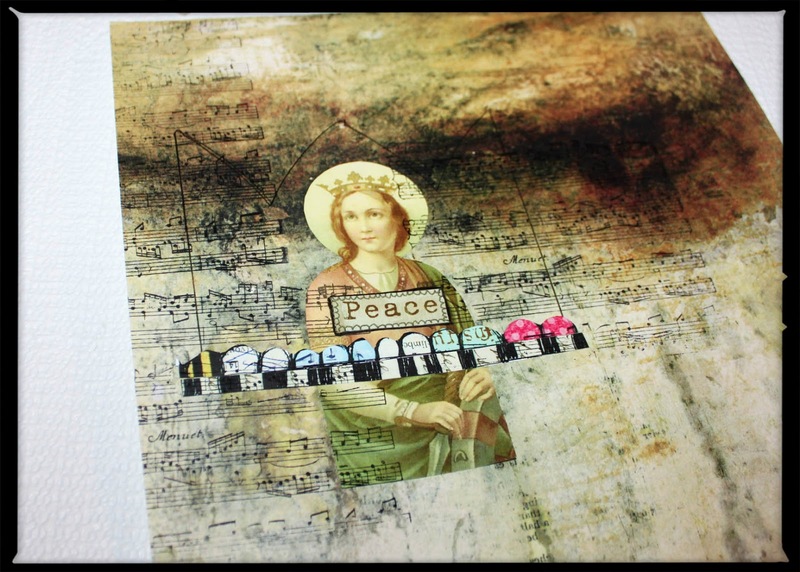 Remove the second layer of adhesive backing from the Incredi-sheet and press your collage image face down on the back of your acrylic piece, right on top of your mirror paint etc. Take care to line it up before pressing down since the strong tape is not repositionable. 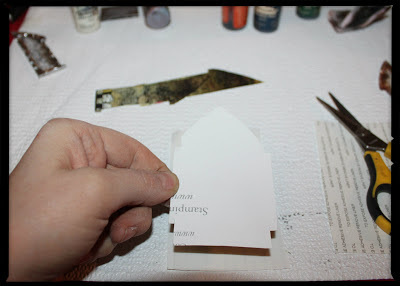 If needed, trim around your acrylic piece with scissors or an xacto knife. 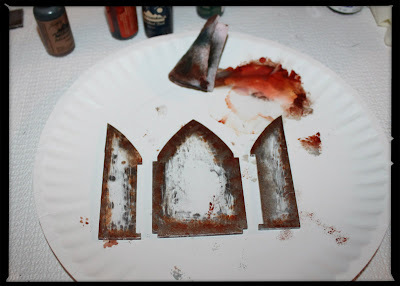 Burnish with a bone folder and repeat for the shrine side panels. 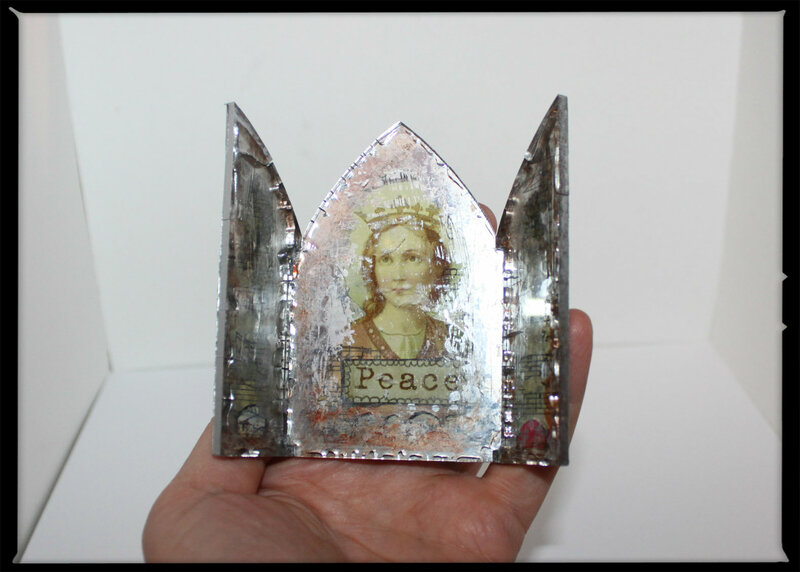 If you don't want to use double sided adhesive, you could also secure the pieces to the acrylic using Diamond Glaze, Glossy Accents, or any clear drying adhesive meant for clear substrates. I love the Incredi-sheets because they are super permanent and not at all messy! If you are like me, you may want the back to look pretty too. 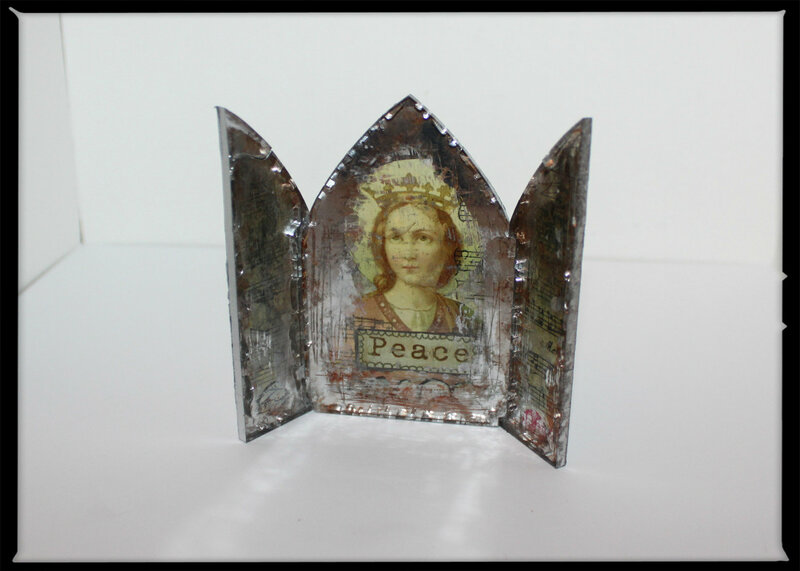 I spray painted mine with silver spray paint and then stamped an image. 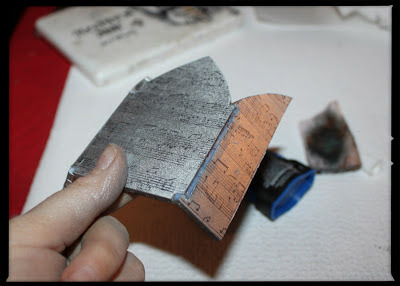 Finally, attach the sides with a bit of glue at the desired angle. I used a dab of E6000 at each end and just to be sure it was nice and secure, I also ran a line of Diamond Glaze along the seam in the back. Again, the mirror doesn't photograph perfectly, but you can really see the reflection in the above photo. It's bouncing nicely off the "ground". 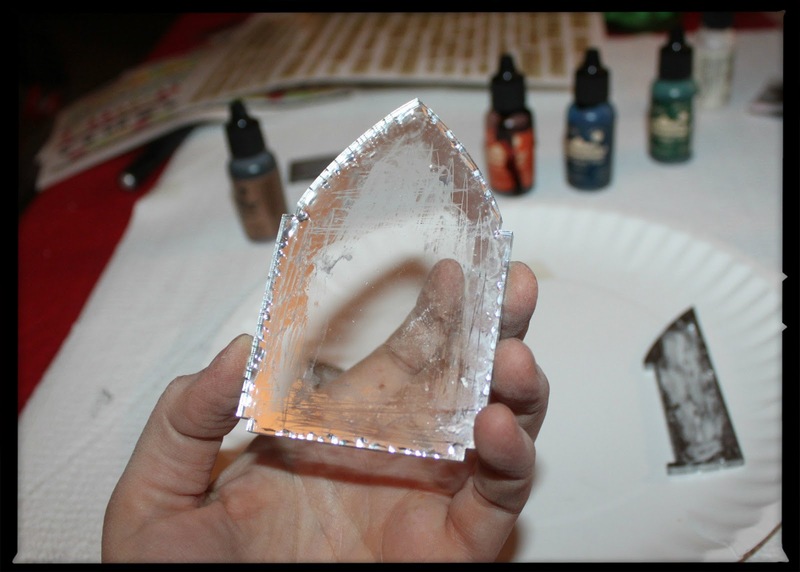 The acrylic is extremely fun to play with and allows you to use several cool techniques. 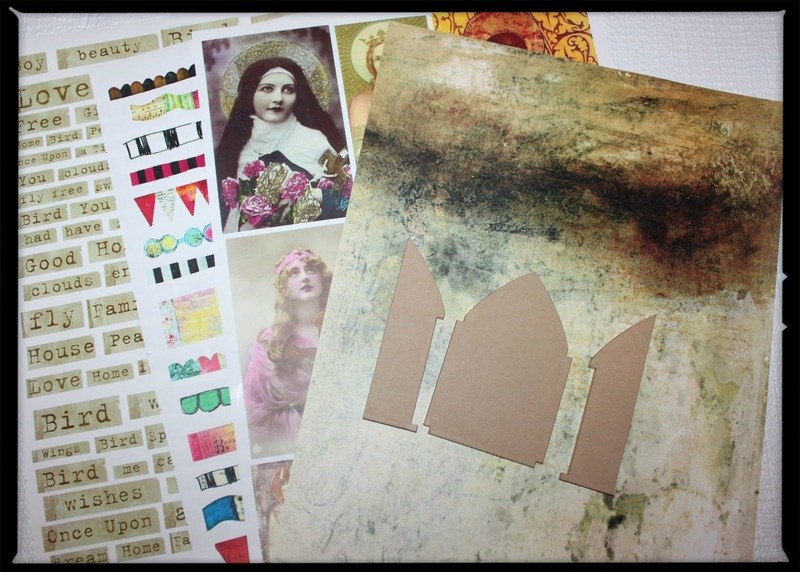 Keep in mind you can also just attach your collage to the front and back like you would a piece of Chipboard or Masonite if you prefer that look! The sky's the limit! Supplies: Arch Clear Acrylic Shelf Shrine, Full of Grace Collage Sheet, Borders Collage Sheet, Collage Words Collage Sheet, Viva Decor Mirror Paint, Alcohol Inks, Incredi-sheet, Mod Podge, E6000, and Diamond Glaze. Other Shelf Shrines also available. New in the Shop, A Giveaway, and Eye Candy! Happy Weekend Everyone! 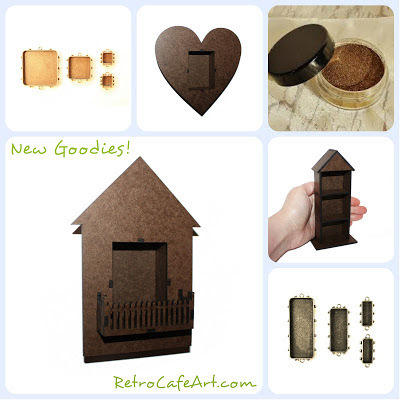 We have lots of NEW goodies in the shop this week! 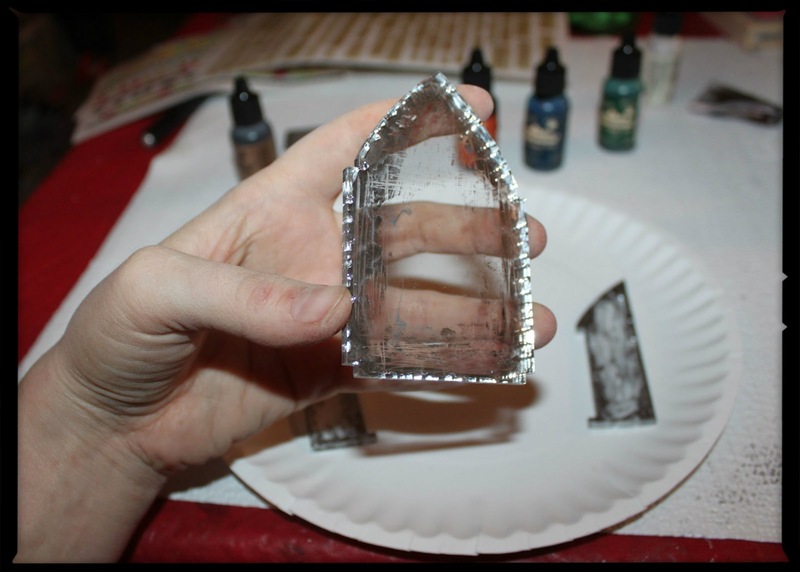 Of course the New Vigil Light Kits and Clear Acrylic Shelf Shrines are my favorite! You can see it all HERE. YES! If you reverse the top and bottom pieces you now have awesome display bases! So you have two design options for these kits! This even works with the Triple Triple Kit. 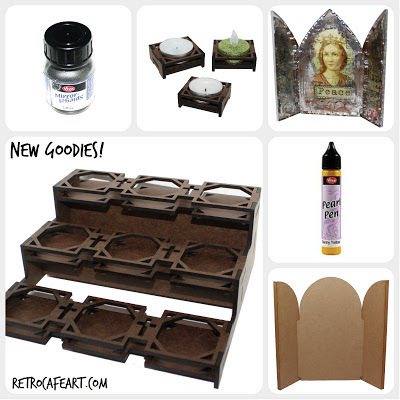 You can use them as bases with SO many of our Shrine Kits. I LOVE happy accidents! I think we are also due for some wonderful Design Team Eye Candy! 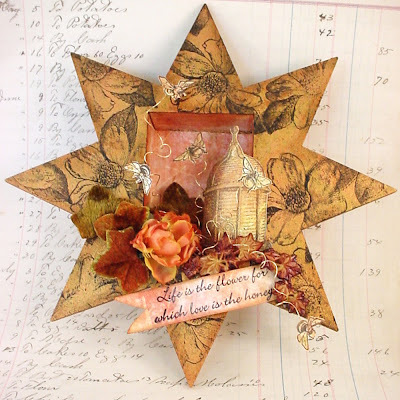 Lynn Stevens created this gorgeous garden inspired Star Shrine. As Lynn stated "This time of year some gardens are the STAR of the show." Wonderful Lynn! 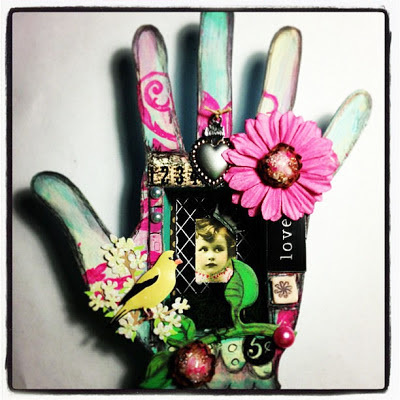 This happy, bright Hand Shrine Kit is by Amy Nieman. Amy also used Collage Sheet DP233, Large Flourish Stencil, and Number Remnant Rubs to create this wonderful piece. Perfect Amy! 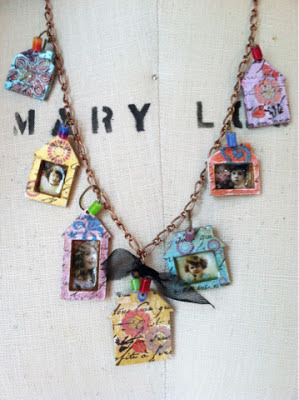 This amazingly sweet necklace is by Gerri Herbst using the House Cut Outs with Charm Holes. I would say Mary Lou has never looked so good!! Adorable Gerri! 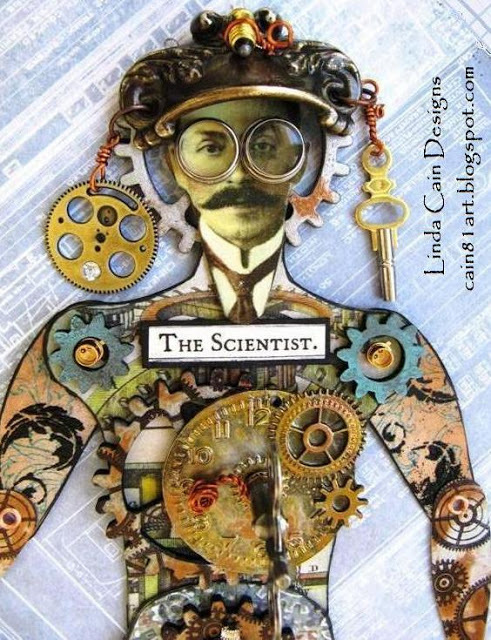 And last but not least, Linda Cain created this fabulous Steampunk Man using the Large Manikin Doll along with several other RCAG goodies! 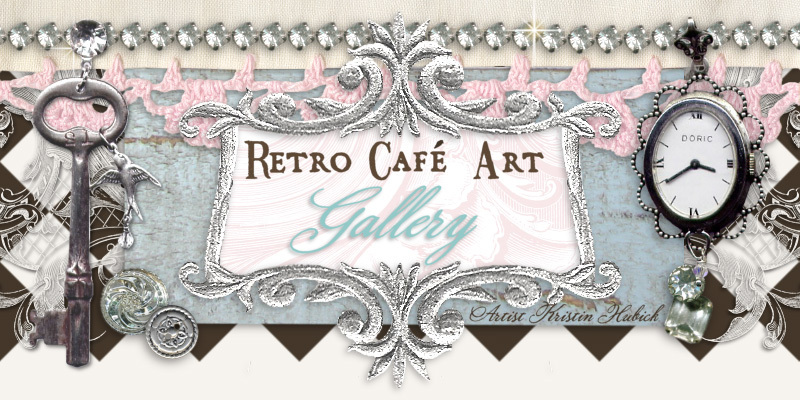 He is so amazing AND you have a chance to win a $25.00 Retro Café Art Gallery Gift Certificate on Linda's Blog. Simply head on over and leave a comment on Linda's Post. Hurry, drawing on June 3rd!